​Beginning with a tournament hosted at The Ballpark at Cowtown in Burleson, Triple Crown Sports has been running baseball events in Texas since 1996. Many teams playing in our Texas Series embrace and appreciate the TCS baseball experience and then make a point to compete in our national events. The jewel of the Texas Series is the Season Opener, held on the first weekend in March and drawing nearly 400 teams to the Dallas Metroplex – this event pulls teams around the Southwest and is the preferred way for programs to assess strengths and weaknesses at the start of the season. - Phone calls, text messages, and emails are returned within 24 hours, Monday - Friday. - We take game-time requests; if we cannot get you in the right slot, and you want out, you get a full refund - ONLY if you submitted the game time requests during the request deadline window. - We try to schedule you away from teams you typically play or that are in your league; if we cannot solve it, you get a full refund if you want out. - We monitor the 'Who's Coming' list daily. Submit your request via the website, and if you want removed from the list the change is made within 24 hours. NO MISLEADING INFORMATION. - Coaches or Team Admins are encouraged to track the 'Who's Coming' list to monitor teams and divisions. Contact Triple Crown if you have questions. - We have two full-time employees working solely on Texas baseball tournaments. - We do not run in the MetroPlex every weekend. Our quality events are in town once a month, offering strong brackets and not breaking up age groups into three different events. 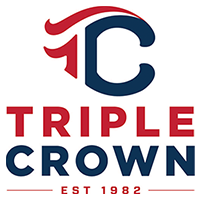 - Triple Crown has no sanctioning fee -- just sign up and play! If you have questions about how to create an account, please ask! - Up-to-date information via the TC Texas Baseball website includes weather updates, game scores and pitching totals, alerts when seedings are posted and final results. - Triple Crown Staff member at every complex to help answer questions or guide teams throughout the weekend.